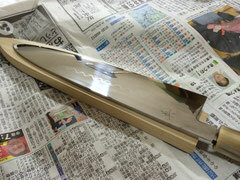 A：Honyaki knives are forged from one single material, usually high-carbon steel. The finest honyaki (mizu-honyaki) are then differentially-hardened, the same method used for traditional katana. Their sharpness is the longest lasting of all Japanese blades. They are extremely difficult to forge, requiring a high level of skill and experience. They are very difficult to sharpen and maintain, and easily damaged if used improperly. They are also more expensive (costing over $1000 for a 240mm gyuto) than other knives, such as Kasumi knives, which are made out of two materials and are easier to forge and maintain. A: We usually ship knives by EMS. The cost is depending on the weight of knives and destination. For example, the total weight 180mm Blue Steel Deba is roughly about 400g so that the shipping cost will be 1,800 JPY if it is going to Europe. *Other shipping methods are available upon customers request such as DHL & FedEx. *Shipping cost is also converted to USD when we make invoice.